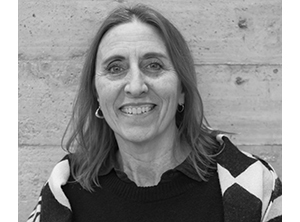 Story by Yuriko Jewett UD ’18. Photos courtesy Vyjayanthi Rao. 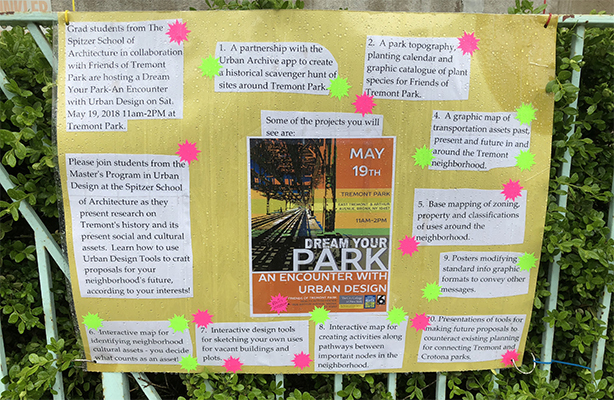 On Saturday, May 19, students from the Spitzer School’s Urban Theory and Urban Design graduate class, taught by Adjunct Lecturer Vyjayanthi Rao, collaborated with Friends of Tremont Park to host a community workshop. 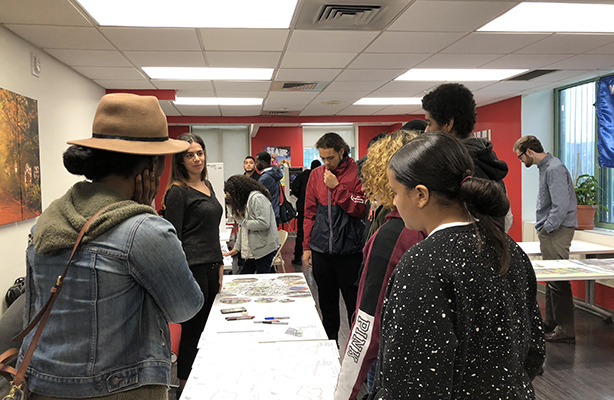 The workshop, Dream Your Park: An Encounter with Urban Design, focused on the Tremont neighborhood in the Bronx with the intention of encouraging dialogue regarding the beautification of Tremont Park. At one point, Tremont Park was connected to neighboring Crotona Park, but the construction of the Cross Bronx Expressway divided the space in two and displaced thousands of residents. 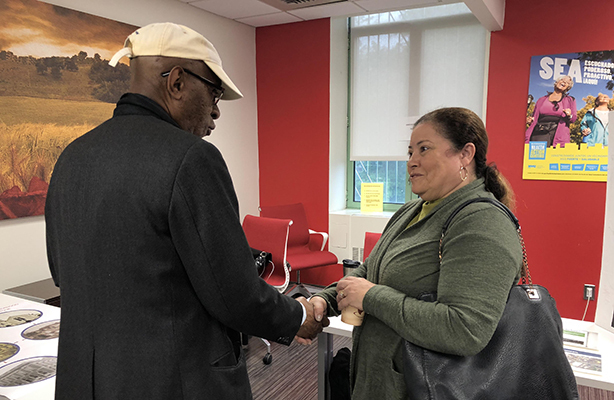 The expressway continues to affect the neighborhood, and residents are paying special attention to Tremont Park as a way to lead the area toward a bright and healthy future. The graduate students presented their work in a science fair–style format. 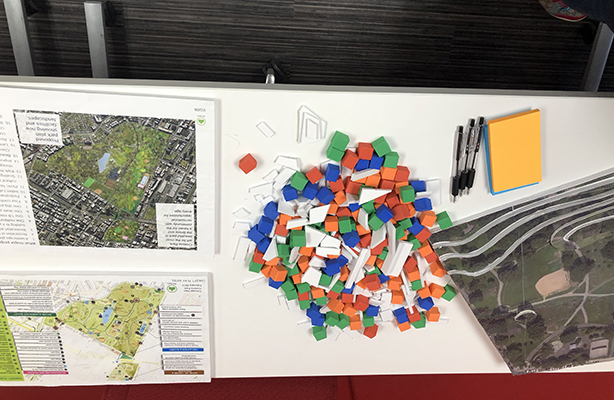 One student project explored design solutions to reconnect the two parks by using an interactive building block component. 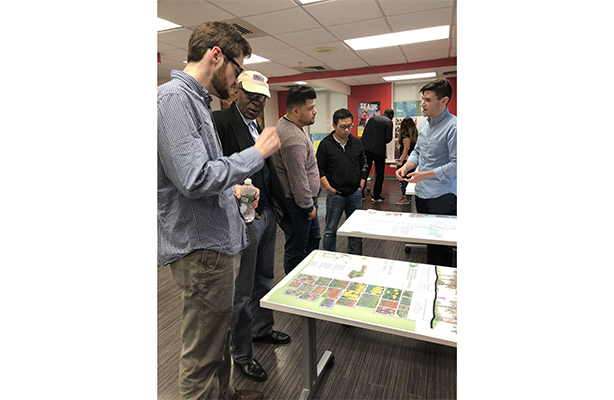 Other presentations included use of planting palettes and landscape schemes to encourage interim beautification solutions while long-term plans are put into place. 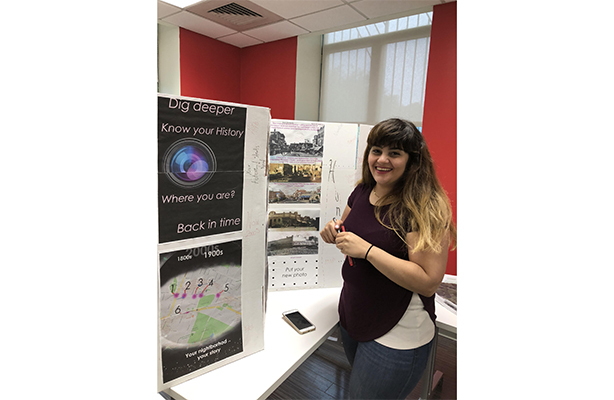 Zoning analysis and cultural assets at the neighborhood scale were explored, and historic preservation tools such as a walking tour in partnership with Urban Archive were also demonstrated. The public showed up and shared their thoughts regarding the students’ ideas. 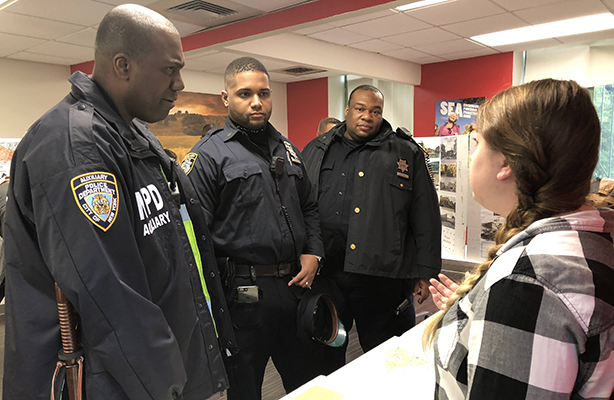 Bronx Parks Commissioner Iris Rodriguez-Rosa spent her morning reviewing all the student exhibits, as did police officers from the local precinct, NYC Parks and Recreation employees, and Friends of Tremont Park supporters. Later that afternoon, students from the Mary Mitchell Family and Youth Center brought many of their own project ideas to the table. 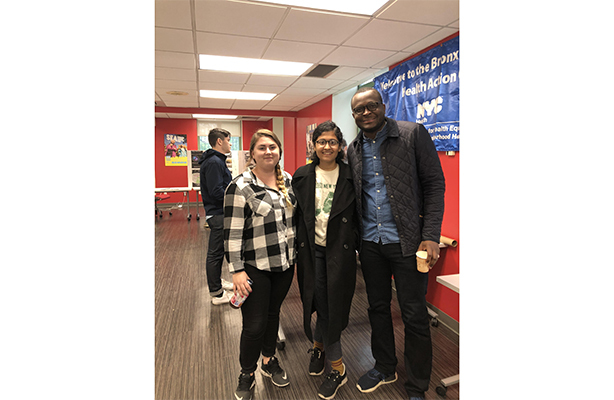 Lastly, the members of the Bronx Neighborhood Health Action Center, who hosted the event in their conference space, provided insight and support to make this urban design community workshop an even greater success.